Recently, Microsoft has introduced support for the OpenAPI specification v3 in Azure API Management. 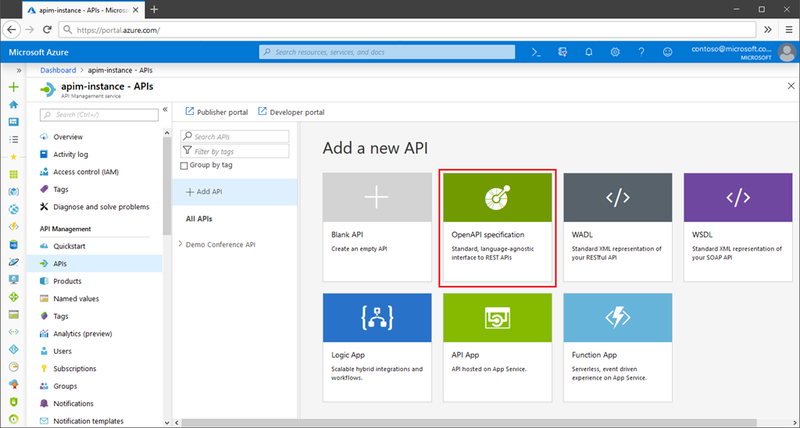 Microsoft has introduced support for the OpenAPI specification v3 in Azure API Management, their service that enables the setting up, publishing, monitoring, and maintenance of APIs. This support has been implemented through the OpenAPI.NET SDK. The OpenAPI specification provides the protocol to describe RESTful web services in a language independent way. As OpenAPI is widely adopted, a diverse ecosystem is available with tools for designing and implementing governance. The specification is governed by the OpenAPI Initiative, owned by the Linux Foundation. These APIs are represented through YAML or JSON files, that are easily readable for humans as well as machines. The announcement says it is now possible to import OpenAPI v3 definitions in Azure API Management, albeit with some restrictions. For now, this can be achieved through the portal or via the REST API. Subsequently, functionalities for exporting the OpenAPI descriptions are also available, either in the developer portal or using another call to the REST API. The developer portal is an automatically generated, fully customizable website, where visitors can discover APIs, learn how to use them, try them out interactively, and finally sign up to acquire API keys. Eventually, before these capabilities will move into general availability, the company will implement export in a JSON format through a REST API call, the company says in some time it is also going to add OpenAPI Specification v3 import and export support in the PowerShell SDK. To learn more, you can visit the official announcement here.